She Wasn’t Ready! 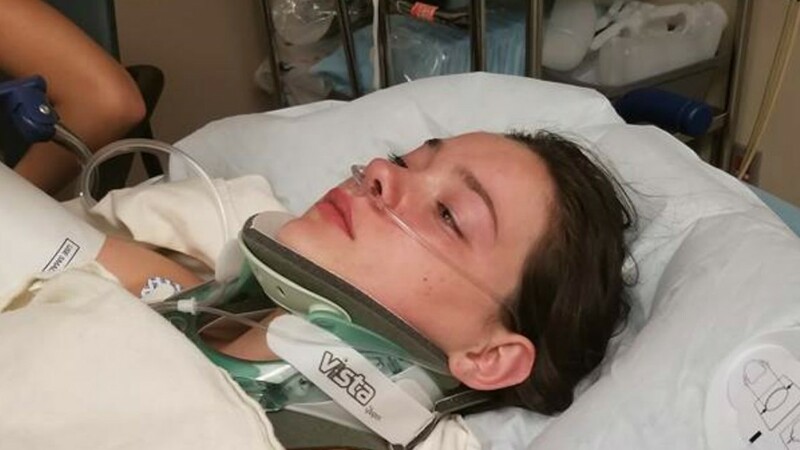 16 Year Old Gets Pushed Off a Bridge (by a Friend) and Gets Seriously Injured. - T.V.S.T. It’s all fun and games until someone gets hurt. That’s exactly what happened here. This crazy incident took place at Moulton Falls on the Lewis River in Yacolt, Washington. 16 year old Jordan Holgerson was getting ready to jump but like anyone, who is looking at a 60 ft jump, she had some concerns. She wasn’t sure if she wanted to actually go through with it. You can hear her in the video, say to her friends, “No I won’t go in”. Then you can hear a man say “Ready” as if they are going to count to three, and before the first numbers is counted, someone shoves her violently off the bridge. This isn’t pushing someone into a pool. This is a 60 foot drop and if you are not somehow parting that water with your feet or hands, it’s like landing on a stack of gym mattresses. Jordan was badly injured. She had five cracked ribs and internal injuries including: a bruised esophagus, an injured trachea, air bubbles in her chest, and a punctured lung. In midair, I think I might have blacked out, But I was aware and awake when I hit the water. She did say that her friend said sorry, but of course you know what she can do with those sorrys! I could’ve died. It could’ve ended a lot worse, is what I’m thinking about. She’s right and that’s a great perspective to have. However…I would be pressing charges.